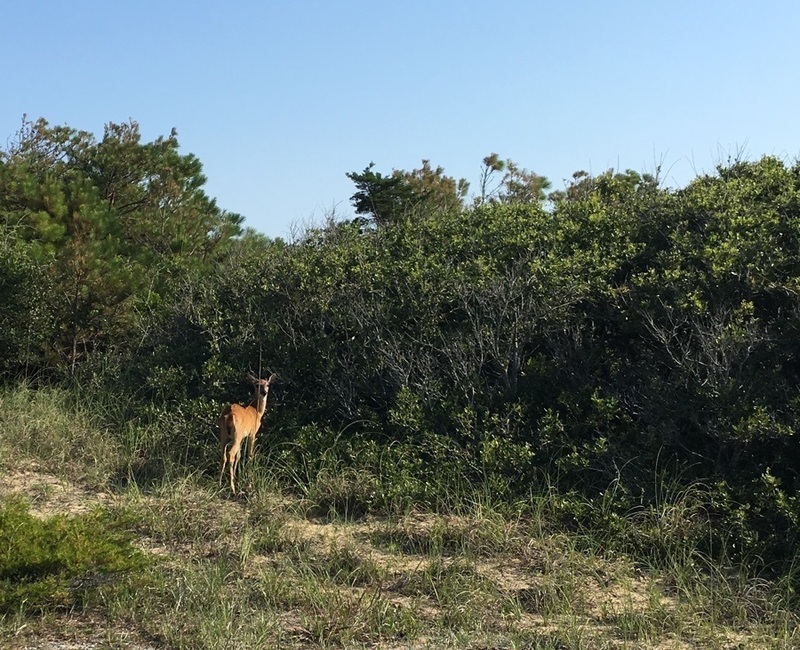 As sad as we were to leave Ocracoke, we had places to go and more of the Outer Banks to see! 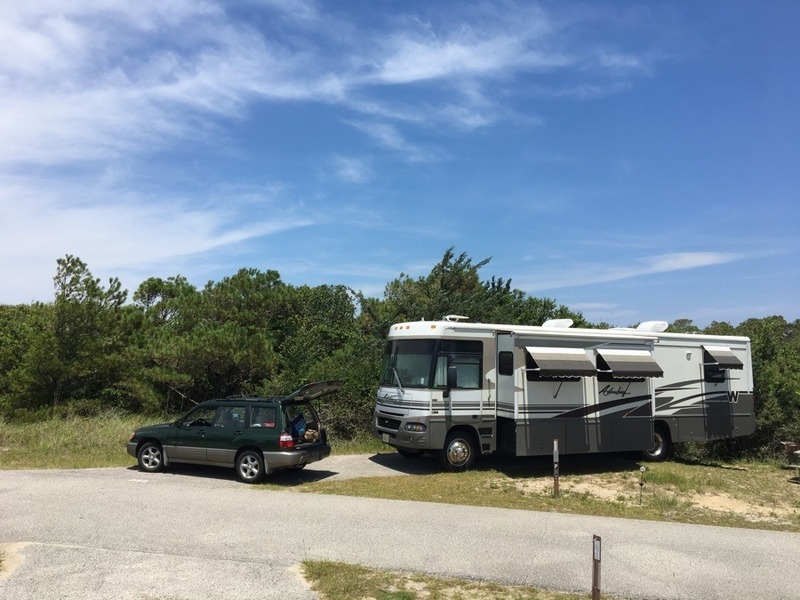 Next stop: Frisco Campground, also part of the Cape Hatteras National Seashore. Remember how we said that Ocracoke is an island with no bridges? That means we got to take the RV on another ferry. And this time there were two of us since The Motorhome Experiment joined us. So that’s two class A motorhomes and their toads on this ferry. Oh, and bonus, this ferry ride is free. But first, we’ve got to wait in line. The line looked like it was going to take a while, so we checked out the beach right next to the RVs. And then they started boarding. Oh crap! We were parked close enough to each other to pass snacks back and forth through the windows. Seriously, I’m going to repeat it. If you can take a ferry ride with your RV, do it! It is quite the experience. So, here’s something annoying about how they run this campground. I think all of the Cape Hatteras National Seashore campgrounds are like this. Your reservation is not for a specific spot. Okay, that’s fine. Many places are like that. But when you arrive, you are told to go scout out which site you want, then come back to the ranger station to register for it. But you have no idea how many people are already scouting the campground. So you pick a site, come back, and find out that someone has already taken that site. Ugh. Now you’ve got to go back out and find more sites. Protip: pick out a few sites your first go round. Then you’ll have backups handy when you find out someone else snapped up your first choice. It would’ve been cool if the ranger had said that in the first place. At Ocracoke, the campground is flat, so you can see other people scouting. Frisco is nestled in the dunes so you can’t tell there are people in front of you. Like Ocracoke, Frisco Campground has no hook-ups at the sites. It was a little warm but not unbearable in early June. May would probably be about right. Also, like Ocracoke, the shower water is not heated. But, on the positive side, the sites are relatively private. And because the campground is in the dunes, some of the sites have ocean views. We went all the way to the back of the campground up on the dune and got a bit of a view. Nice! On the downside, our site was a little tight. But we didn’t hang out here much and instead spent time exploring. The beaches here are lovely just like Ocracoke. And you can have a beach bonfire, but you need to get a permit first. As far as wildlife goes, there are deer in the campground. And bunnies. If you have a 4-wheel-drive vehicle, you can get a permit to take it on the beach. And there’s off-road vehicle (ORV) access at Frisco Campground. We were going to get a permit for our Subaru, but the woman at the visitor center talked us into going to look at the access first. She said the all-wheel drive would be okay, but clearance might be an issue. And when we went down there, we watched some guy stuck in the sand and decided against it. In the Outer Banks, you’ve got to visit the lighthouses. And not just to get stamps for your National Parks Passport. All of the lighthouses and light stations are picturesque, give you fantastic views if you climb them and some have interesting stories. They didn’t take it apart and rebuild it. They dragged it. You can still see it’s path from the top of the lighthouse. Crazy! Of course, I don’t have a good photo of that for some reason. When we hit a new area, we always like to consult Atlas Obscure for the more off-beat attractions. When we stayed at Frisco Campground, we found out this Futuro House was nearby. In the 1960s people bought these as vacation homes. The current owners of this one are playing up its flying saucer shape to the extreme. There are 60 of these Futuro Homes still in existence. Find one near you with Atlas Obscura’s map. As a vegan, you don’t come to this area for the spectacular food choices. But Buxton Munch had a tasty black bean wrap that hit the spot. And the decor had a cool hippie vibe. It’s a family-owned restaurant, and the owners are super friendly. As always, if you’d rather watch a video, The Motorhome Experiment has you covered! You should totally subscribe to their channel while you’re there. The more you move north in the Outer Banks from Ocracoke, the busier and more touristy it got. So choose your route based on how you like to travel. If you absolutely must have hook-ups, there are private campgrounds that have them. It’ll cost quite a bit more though. We were happy with the $28/night at Frisco Campground.